The exhibition "The Poetics of Space" takes its title from the book by French philosopher Gaston Bachelard, first published in 1957 in which Bachelard insists on the transfer of the poet's affectivity to the surrounding space and objects; a process, which endows all matter with a poetic essence and expands the intimate space into a poetic space: "To give an object its own poetic space is to give it more space than it has objectively [...], it is to follow the expansion of its intimate space." This expansion of the intimate space into a poetic space may also be found in the visual arts, in a dialectic between words and materiality in relation to space. 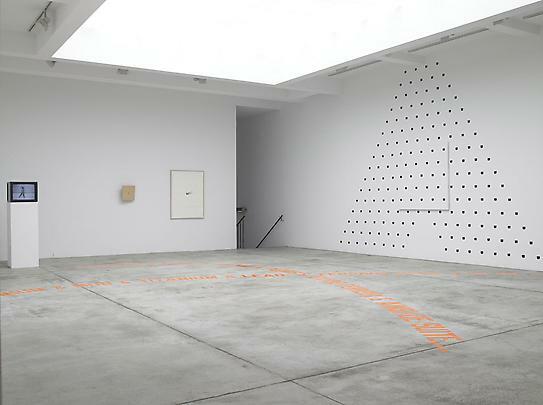 In his book "The Space of Words," a philosophical analysis of the relationship between words and space, Jacques Rancière cites Marcel Broodthaers's appropriation of Stéphane Mallarmé's poem "A throw of the dice will never abolish chance." (1914). In 1969, Broodthaers created a series of plates based on Mallarmé's poetry, substituting the words with black bands, a shift between different mediums, where "signs become forms and forms become acts" a displacement of word and image which generates space. 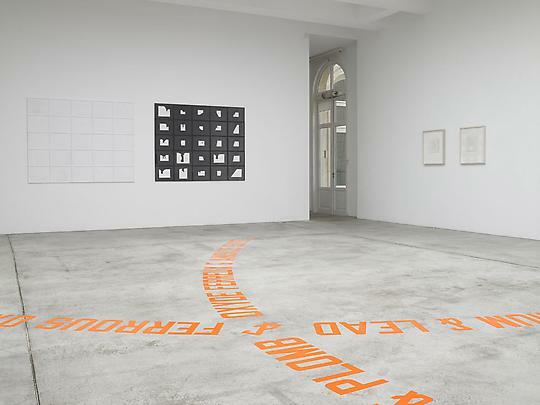 Taking Broodthaers appropriation of French poetry as the point of departure, the spatial interventions presented in this exhibition, give way to poetic works in which space is constructed, deconstructed, and reconstructed and in which space is thought, expressed and defined. On the ground floor, Niele Toroni's "Homage to Rimbaud" embraces imaginary and concrete space in an installation in situ, based on Arthur Rimbaud's synesthesia poem "Vowels: I Red, A Black, U Green". The brushstrokes composing the letter 'A' are both painted on canvas and also directly onto the wall with imprints of a no. 50 paintbrush, which are repeated at regular intervals of 30 cm. Toroni uses this reductive and systematic working process, which he has developed over a period of thirty years. 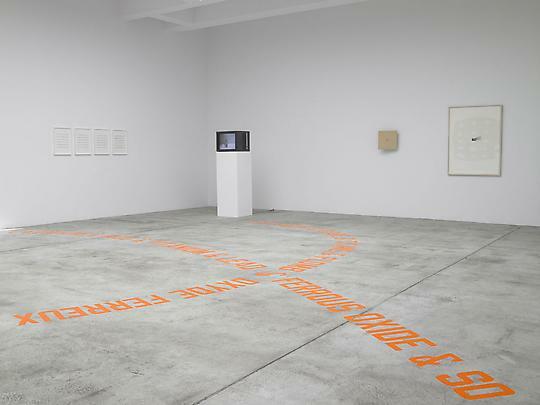 Lawrence Weiner's statement "CADMIUM & MUD & TITANIUM & LEAD & FERROUS OXIDE & SO ON..., "1991, a range of heterogeneous material combined in a spatial relationship, covers large areas of the gallery floor. The artist's radical redefinition of sculpture in which language functions as sculptural material, relies also on the relationship of human beings to objects and of objects to objects in relation to human beings, within the realm of universal and communal materials, in a juxtaposition of materiality and idea. Although eschewing the literary or metaphorical, and focusing on empirical existing facts, materials, states, processes, etc., the work expands into the poetic space upon its reception. This relationship between materiality and idea is further explored in Yvonne Rainer's seminal work "Trio A" which is composed of a sequence of movements that are without phrasal segmentation, a fluid choreography without still moments, perpetually unpredictable, refusing conventional dance patterns. The body's capacity to speak is a poetic expression of one's self, inhabiting and defining the surrounding space. The composition is also essentially a script, a choreography traced into space: "If all the trajectories of the dance were laid out on the floor, they would comprise for the most part straight lines in 45-and-90 degree angles with a few connecting arcs". As in Weiner's work, "Trio A" is always recreated; the work is reproduced when it is taught to "non-dancers" and therefore proposes new kinds of 'social scripts'. Pierre Huyghe's "Silence Score" is a transcription of John Cage's, silent masterwork 4'33", 1952, into a flute sonata, achieved through a converter program. Cage's original score which requires its performers to make no sound for the duration of four minutes and thirty three seconds consists of the environmental surrounding sounds that are audible in the performance space. The score was composed for any instrument, instructing the performer not to play the instrument for the entire duration of the piece. The space "in between" the partition/transcription and the imagined music of the flute sonata is thus brought to the fore. Similar to the absence of sound in "Silence Score", Iñaki Bonillas's work "Fotografías delineadas", 2006 show how memory occupies space in a series made of photogenic and pencil drawings on photographic paper. In a new version of "Naufragio en silencio", especially created for the exhibition, the most intimate space of production of an artist, his work table, becomes the source of inspiration: "In « Naufragio en silencio », I have cut sheets of paper in the size of my work table, reducing them to eighty percent, and with a ruler I have made the drawings on paper, trying to find the centre. The white line on blue ground evokes the horizon, the sea, and the equilibrium. Giovanni Anselmo's work often investigates the finite and the infinite, the microcosm and the macrocosm as well as the elemental laws and forces of nature. In his work "Direzione, (Direction)", 1987 a compass is drawn in the center of the canvas evoking the properties of gravity and magnetism, both of which help orient us: "I, the world, things, life--we are points of energy, and it is not as necessary to crystallize these points as it is to keep them open and alive." Giovanni Anselmo's citation also points towards Gaston Bachelard's idea of space: "Space that has been seized by the imagination cannot remain an indifferent space, it cannot be left to the surveyor to reflect upon and measure. It has been lived in. And it has been lived in not in its positivity but with all the partialities of the imagination [...] The imagination constantly imagines and is enriched by new images." Gabriel Orozco's work "P.D. 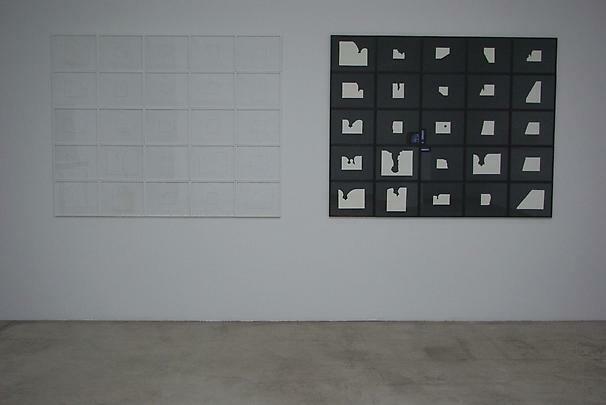 4", 2008 and "Plaster Paper (2)", come from a recent series of plaster drawings. Orozco uses the process of dipping paper into liquid plaster and sometimes combines this with graphite drawing. These works point towards his investigations into the phenomenology of structures, exploring the spatial representation of matter and organic processes within a lexicon of systems and games, demonstrating chance operations and the artist's own empirical strategies within a framework of abstraction and geometric fields. Both drawings combine geometric and organic forms with spatial and textual references. 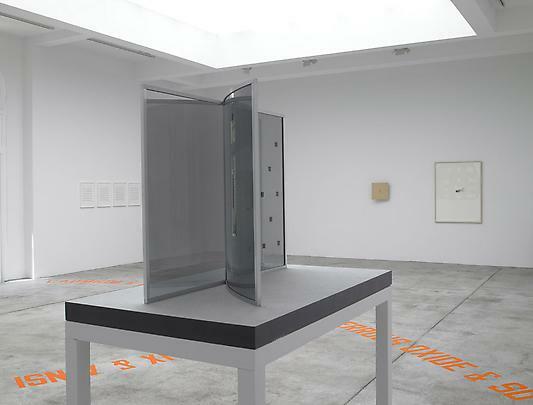 Dan Graham's model "One Straight Line Crossed by One Curved Line", 2007/2008, recently realized in Basel, provides, as in the other models that precede or follow the artist's built pavilions, a break with rectilinear form. Its reflective anamorphic surfaces which are both transparent and mirror the surrounding space are functional structures, hybrids between sculpture and architecture. On the lower floor, Mario Garcia Torres's work explores language, its circulation and its activation in the exhibition space revisiting the history of Conceptual Art. Through his interventions, slide projections, films and installations, Garcia Torres rethinks this history through explicit reference to other artists' works and by adding new dimensions of narration. The 16 mm film on view at the gallery, "My Westphalia Days", is a short film based on a few lost days in the history of an icon of contemporary sculpture. 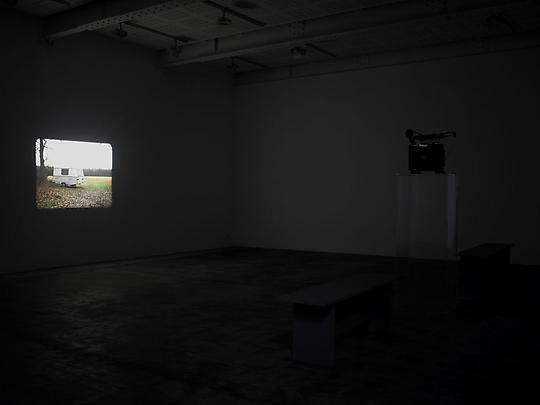 The Conceptual artist Michael Asher has presented, as an artwork, a commonplace caravan at Sculpture Project Munster since its inception in 1977. On 21 July 2007, the caravan disappeared, only to be discovered a couple of days later at the edge of a forest in the outskirts of the city. Garcia Torres has proposed a fiction about these missing days, filming a 30-year-old car stealing a caravan almost identical to the one used by Asher from the site where it disappeared. The result is an open-ended, fragmented fiction that follows the many paths of the caravan throughout Westphalia.